i’ve been eating zha jiang mian for years. what? what is this asian thing you speak of? i liken it to a sweet version of spaghetti bolognese, but with sweet black bean sauce instead of tomato sauce. it’s soft and comforting, not to mention extremely easy. at least this iteration is; it’s from my mom’s college friend, and i make no claims for authenticity. you saute an onion (or not, if that’s not how you roll) for as long as you like. on good days, i do this until the onions are brown and meltingly tender; on not-as-motivated days, i cook them just until they’re translucent so that they don’t have that raw onion bite. while your onions are going, cook some pasta in a separate pot; i like to do about half a pound, but i’m not a big carb person. if you love noodles and/or love leftover noodles, by all means make more. a note on what noodles to use: there are no rules. i use whatever’s in the house, usually some type of corkscrew pasta that clings nicely to the sauce. spaghetti would also work. if you want to go more towards the traditional route, go for the fresh chinese noodles you can find in the refrigerated section of your local chinese (or other asian) market. they have a chewy quality that juxtaposes against the tender meat and onions wonderfully. when your onions are right where you want them (sorry, but not really, for the throwback. i refuse to apologize for my younger self), add a pound or so of ground meat. i usually go for beef, though pork, chicken, turkey, lamb, even crumbled tofu, could work well here. cook that until it’s no longer pink and is instead this unappealing gray color that makes me think of brains; so appetizing! (i find it hard to convey sarcasm through text). and this is the part that makes it zha jiang mian: the can of sweet bean sauce. the can i use is like the one in this picture. if you’ve never seen the sauce before, it’s really dark and thick. the flavor is intensely sweet, so i like to add a splash of water to help dilute it. and although it’s called sweet bean sauce, it’s not bean-tasting as you might expect. the bean aspect is much more mild than, say, the beans on the side (refried or otherwise) at your local mexican restaurant. to adjust the sauce, typical seasonings i might include sugar, soy sauce, fish sauce and rice wine vinegar. i don’t recommend adding sugar unless you really enjoy sweet lunch/dinner/whatever. soy sauce and fish sauce help keep the sauce savory and rich, but if you want a bit of brightness, i suggest the vinegar. most of the time i just add some more water, since the bean sauce can be pretty strong and i end up liking where it’s at. when the sauce is dark, thick and rich, add the pasta. stir until the pasta doesn’t look so pale and vampire-ish, then dish it up with julienned cucumber. the cucumber adds a fresh crunch, which is essential in such a dish. you can also add some chopped scallion or green onion if you want a bit of a zing. and that’s it for zha jiang mian! you have a satisfying pasta dish that’s a bit out of the norm but not weird enough to banish to your conversations with others that involve the weirdest recipes you’ve seen in the food blog world (or maybe it’s just me who talks about them). 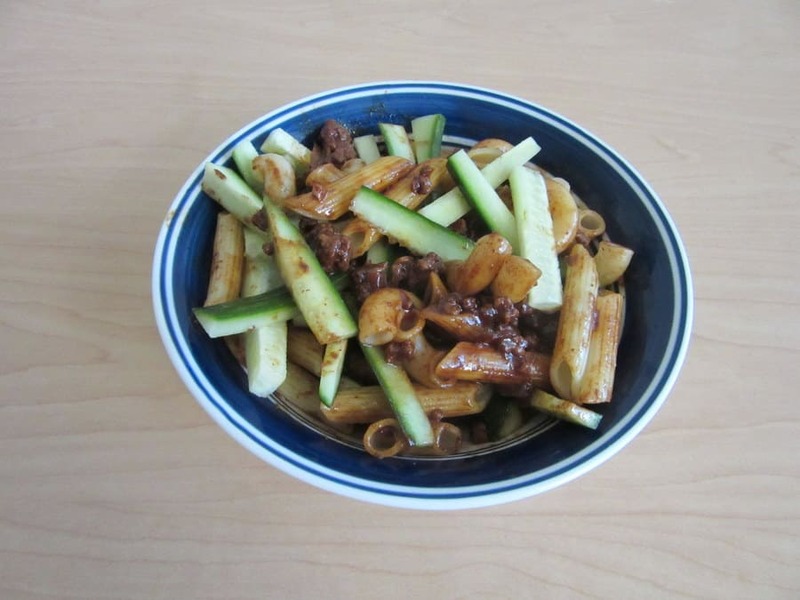 if you want to make it healthier, up the amount of cucumbers and use less pasta. or use lower fat beef, or even sub in turkey or chicken. the nice thing about cooking is that you don’t have to be precise, and you can do whatever the heck you want. Awesome. There's a Korean market up the street. I think I need to go shopping right exactly now.